The audit of accounts for Withyham Parish Council for the year ended 31 March 2018 has been completed and accounts have been published. Please click here or contact the parish office for a copy. Welcome to Withyham Parish Council’s website. Withyham Parish has approximately 3000 residents and falls under the local government of Wealden District Council which, in turn, comes under East Sussex County Council. The Parish is divided into 3 electoral wards: Groombridge (New), St John’s and Withyham/Blackham. The latter is the largest area, though the least populated; the key densities of population being Groombridge and St John’s. The Council is made up of thirteen Councillors who help administer the affairs of the Parish, with a part time clerk and assistant clerk. They meet every second Monday of the month as a full Council and additionally as members of various committees and sub-committees covering such matters as planning, finance and Rights of way. Members of the public are welcome at these meetings and the minutes are posted on the Parish Council website. 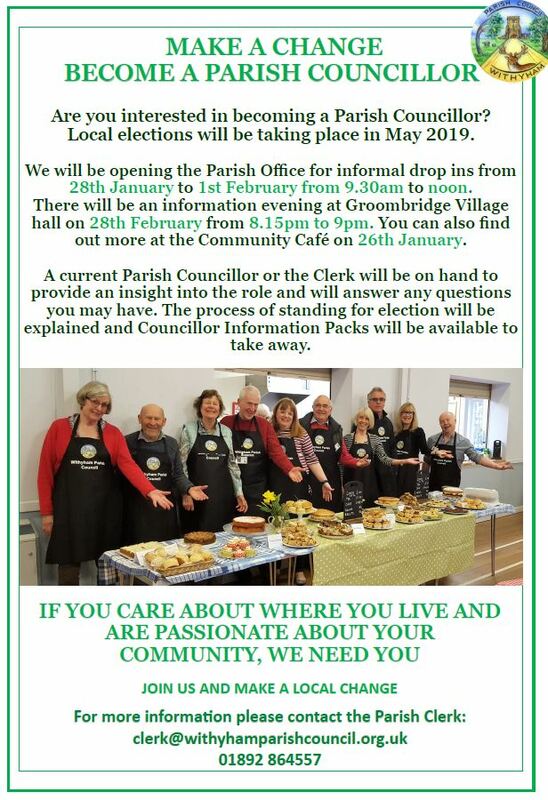 We also display information on our noticeboards which are at St John's Church, Cooks Corner London Road, The Dorset Arms Withyham, the junction of Balls Green and Station Road, Blackham Village Hall, Teasley Mead Blackham and Groombridge Post Office. The Parish Council is funded by a precept, the amount householders of the Parish pay as part of the Council Tax, in order to maintain facilities and to respond to the needs of the community. For information about the Parish Council's priorities for the five years 2016-2021, please see our parish plan 'Forward for 5', and read more about how it was developed here. The Clerk of the Parish Council can be contacted on 01892 864557 or clerk@withyhamparishcouncil.org.uk. Every year Withyham Parish Council invites local groups to apply for funding through the Grants Application process. Interested in becoming a Parish Councillor find out more here.